The overpopulation of the Earth reached the breaking point by the late 26th century. Thus, humanity had to find new frontiers and a new home. Knowing that this time would come, Earth had been in a centuries-long terraforming process of Mars, introducing moss and cockroaches to hasten the transformation. Two missions, Bugs 1 and Bugs 2, traveled to Mars to see the results of that terraforming, and what they discovered was the horror called Terra Formars, giant humanoid cockroaches. The new mission to Mars, Annex 1, is launched. It is crucial to finding a cure for the A.E. Virus currently plaguing Earth. A safe strain of the virus must be discovered, or the mission must bring back a bunch of possible carriers. However, during the trip to Mars, the crew discovers that Terraformars have infiltrated the Annex 1. Captain Akari Hizamaru initiates “Emergency Plan Delta,” dividing the humans into six divisions. As Terra Formars, Vol. 7 (Chapters 53 to 63) opens, the U.S./Japan Divisions 1 and 2 regroup. It is the end of Day 1 (April 13, 2620), 38 days until rescue. Meanwhile, back on Earth, tensions arise. The nations involved in the Mars expeditions: the U.S., Japan, China, Russia, Germany, and Rome (the Roman Federation) convene to negotiate their interests. China offers a new rescue, and so begins a battle of choosing sides. Back on Mars, the situation reflects what is happening on Earth; national interests create conflict. Akari Hizamaru and Michelle K. Davis lead a team to rendezvous with Annex 1, not realizing what is waiting for them. 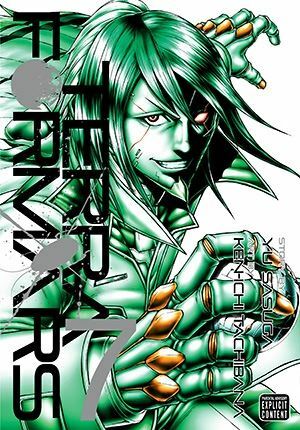 THE LOWDOWN: The Terra Formars manga takes another turn in terms of plot and narrative. The prior three volumes focused on genetically-altered humans whose bodies had been greatly modify with animal and insect-like abilities. Terra Formars Volume 7 introduces more international conflict and conspiracy, on Earth and most surprisingly on Mars. The storytellers push the Terra Formars – the roach monsters – into the background and move intrigue forward. Once again, Terra Formars proves that it is indeed a strange manga, all the more reason to keep reading. POSSIBLE AUDIENCE: Fans of seinen manga and of weird fiction will want to try the VIZ Signature title, Terra Formars.